What is meant by Dispatcher & Thread Affinity? What is Visual Tree and Logical Tree? What about Hardware Acceleration and Graphics Rendering Tiers in WPF? After working for more than 6 months in WPF, it is time to start writing on the basics of WPF. I have already put up a few articles on this topic, which basically deal with some specific problems. Now it is time to go beyond that, and to let you understand how / why WPF came to us as a revolution to UI development. As this is an article for beginners to intermediate level programmers, I will try to give as many basic examples as I can. I will also put a few reference links to each article of the series to make you navigate the other articles easily. 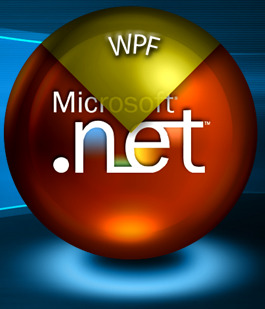 As the name says all, WPF is actually a new framework introduced with .NET framework 3.0 which actually puts forward a new set of classes and assemblies which allow us to write programs more efficiently and flexibly. It uses Direct3D rendering which employs graphics cards to render the output on the screen. Thus the drawing in the form will be smooth and also there is a chance to utilize the hardware capabilities installed in your machine. In case of traditional GDI forms application, it is not possible to use advanced graphics capabilities and hence Windows Forms application will always be inefficient in comparison to WPF. Another important thing that I must address in this regard, GDI Windows forms application uses Operating system controls to build its application. Thus it is basically very hard to customize them in your own application. WPF controls are actually drawn over the screen, and hence you can customize controls totally and modify their behavior when required. Device Independent Pixel (DPI) WPF introduces Device Independent DPI Settings for the applications built with it. For a window, it is very important to calculate how many Dots Per inch(DPI) the screen could draw. This is generally dependent on the hardware device and operating system in which the application runs and also how the DPI settings is applied on the Device. Any user can easily customize these settings and hence make the application look horrible. Windows forms application uses pixel based approach so with changing DPI settings, each control will change its size and look. Let's say you have drawn a box, just like the one in the figure, which is 1 inch long in 96 dpi screen. Now if you see the same application in 120 dpi settings, the box will appear smaller. This is because the things that we see on the screen are totally dependent on dpi settings. In case of WPF, this is modified to density based approach. That means when the density of pixel is modified, the elements will adjust them accordingly and hence the pixel of WPF application is Device Independent Pixel. As you can see in the figure, the size of the control remains the same in case of WPF application and it takes more pixels in case of 120 DPI application to adjust the size properly. Built-In Support for Graphics and Animation : WPF applications as being rendered within DirectX environment, it has major support of graphics and animation capabilities. A separate set of classes are there which specifically deal with animation effects and graphics. The graphics that you draw over the screen is also Vector based and are object oriented. That means, when you draw a rectangle in WPF application, you can easily remove that from the screen as rectangle is actually an object which you always have a hold on. In a traditional Windows based application, once you draw a rectangle, you can't select that individually. Thus programming approach in case of WPF is completely different and more sophisticated than traditional graphics approach. We will discuss graphics and animation in more detail in a later section of the article. Redefine Styles and Control Templates In addition to graphics and animation capabilities, WPF also comes with a huge flexibility to define the styles and ControlTemplates. Style based technique as you might come across with CSS is a set of definitions which defines how the controls will look like when it is rendered on the screen. In case of traditional windows applications, styles are tightly coupled with each control, so that you need to define color, style, etc. for each individual control to make it look different. In case of WPF, Styles are completely separated from the UIElement. Once you define a style, you can change the look and feel of any control by just putting the style on the element. Most of the UIElements that we generally deal with are actually made using more than one individual elements. WPF introduces a new concept of Templates, which you might use to redefine the whole control itself. Say for instance, you have a CheckBox, which has a Rectangle in it and a ContentPresenter (one where the caption of the TextBox appears). Thus you can redefine your checkbox and put a ToggleButton inside it, so that the check will appear on the ToggleButton rather than on the Rectangle. This is very interesting. We will look into more detail on Styles and ControlTemplates in later section of the article. Resource based Approach for every control Another important feature of WPF is Resource based approach. In case of traditional windows applications, defining styles is very hectic. So if you have 1000 buttons, and you want to apply Color to each Buttons to Gold, you need to create 1000 objects of Color and assign each to one individual elements. Thus it makes it very resource hungry. In WPF, you can store styles, controls, animations, and even any object as resource. Thus each resource will be declared once when the form loads itself, and you may associate them to the controls. You can maintain a full hierarchy of styles in a separate file called ResourceDictionary, from which styles for the whole application will be applied. Thus WPF application could be themed very easily. New Property System & Binding Capabilities In the next step, I must introduce the new property system introduced with WPF. Every element of WPF defines a large number of dependency properties. The dependency properties have strong capabilities than the normal properties. Thus when I define our new property, we can easily register my own property to any object I wish to. It will add up to the same observer that is associated to every object. As every element is derived from DependencyObject in its object hierarchy, each of them contains the Dependency Observer. Once you register a variable as Dependency property, it will create a room on the observer associated with that control and set the value there. We will discuss this in more detail in later sections of the series. According to the definition, XAML is an XML based declarative markup language for specifying and setting the characteristics of classes. In other words, XAML is a language used by WPF, Silverlight or any other application which can declare classes by itself. So, you can declare a variable, define the properties of any class and directly use it in your application. The XAML parser will automatically parse and create the actual object while it renders the application. XAML is generally used to define layout of UI, its elements and objects for static and visual aspect. We cannot define flow of a program using XAML. So even though there are large capabilities of XAML, it is actually not a programming language, rather it is used to design UI of the application. Thus XAML employs other programming languages like C#, VB.NET, etc. to define the logic in code behind. ExpressionBuilder is the best tool to generate XAML. PresentationFramework.dll: Creates the top level elements like layout panels, controls, windows, styles, etc. PresentationCore.dll: It holds base types such as UIElement, Visual from which all shapes and controls are Derived in PresentationFramework.dll. WindowsBase.dll: They hold even more basic elements which are capable of being used outside the WPF environment like Dispatcher object, Dependency Objects. I will discuss each of them later. 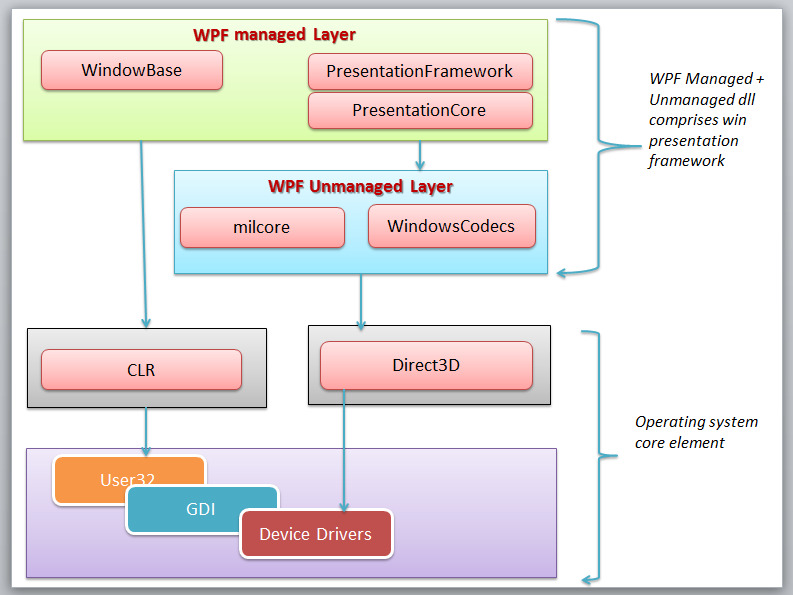 Unmanaged Layer (milcore.dll): The unmanaged layer of WPF is called milcore or Media Integration Library Core. It basically translates the WPF higher level objects like layout panels, buttons, animation, etc. into textures that Direct3D expects. It is the main rendering engine of WPF. WindowsCodecs.dll: This is another low level API which is used for imaging support in WPF applications. WindowsCodecs.dll comprises a number of codecs which encode / decode images into vector graphics that would be rendered into WPF screen. Direct3D: It is the low level API in which the graphics of WPF is rendered. User32: It is the primary core API which every program uses. It actually manages memory and process separation. GDI & Device Drivers: GDI and Device Drivers are specific to the operating system which is also used from the application to access low level APIs. In the above figure, you can see how different framework elements communicate between one another that I have just discussed. There are quite a few things that you must know before starting with WPF applications. Dispatcher is a class that handles thread affinity. It is actually a prioritized message loop through which all elements are channeled through. Every UIElement is derived from DispatcherObject which defines a property called Dispatcher which points to the UI thread. Thus from any other thread, if you want to invoke or access UI component, you need to Invoke using Dispatcher thread. DispatcherObject actually has two chief duties, to check and verify if the thread has access to the object. Every programming style contains some sort of LogicalTree which comprises the Overall Program. 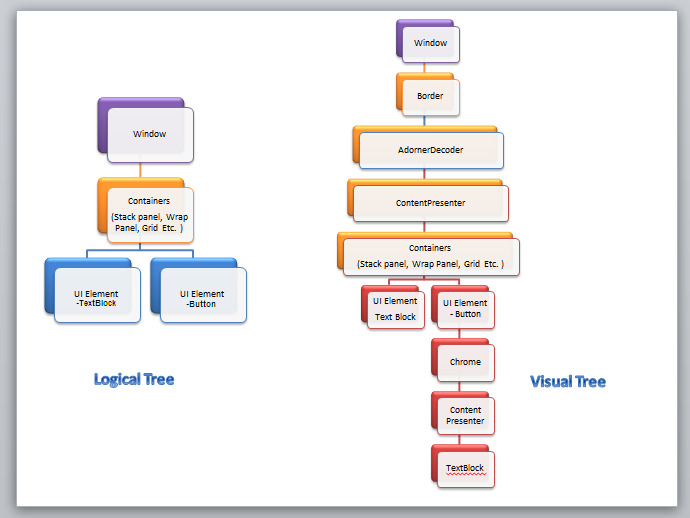 The LogicalTree comprises the elements as they are listed in XAML. Thus they will only include the controls that you have declared in you XAML. VisualTree on the other hand, comprises the parts that make up the individual controls. You do not generally need to deal with VisualTree directly, but you should know how each control is comprised of, so it would be easier to build custom templates using this. I personally always like to see the VisualTree before using it. ExpressionBuilder is the one tool that allows you to generate the actual control. When a Routed event which is registered, is invoked, it Bubbles / Tunnels through the Visual Elements and calls all the Registered RoutedEventHandlers associated within the Visual Tree one by one. To discriminate between the two, WPF demarcated events with Preview*** as the events which are Tunneled and just *** for the events that Bubbles. For instance, IsPreviewMouseDown is the event that tunnels through the Visual Child elements while MouseDown Bubbles. Thus Mouse Down of the Outermost element is called first in case of IsPreviewMouseDown while Mouse Down for the innermost element will be called first in case of MouseDown event. Every WPF control is derived from DependencyObject. DependencyObject is a class that supports DependencyProperty, a property system that is newly built in WPF. Every object is derived from DependencyObject and hence it can associate itself in various inbuilt features of WPF like EventTriggers, PropertyBindings, Animations, etc. Every DependencyObject actually has an Observer or a List and declares 3 methods called ClearValue, SetValue and GetValue which are used to add/edit/remove those properties. Thus the DependencyProperty will only create itself when you use SetValue to store something. Thus, it is resource saving as well. We will look at DependencyProperty in detail in other articles of the series. Another important thing that you should know is how the WPF graphics is rendered. Actually WPF rendering automatically detects how much hardware acceleration is supported by the current system and adjusts itself accordingly. The graphics rendering detects the appropriate tier for rendering the output accordingly. Video RAM: This determines the size and number of buffers that the application might use to render its output. Pixel Shader: It is a graphics utility which calculates effects on per pixel basis. Vertex Shader: It is a graphics processing utility that performs mathematical calculations on Vertex of the output. They are used to add special effects to objects in 3D environment. MultiTexture Blending: This is a special function that allows you to apply two or more textures on the same object in 3D. Now the rendering engine of WPF determines which tier is appropriate for the current application and applies the rendering tiers accordingly. TIER 0: No graphics hardware acceleration takes place, rather everything is rendered using Software. Any version of DirectX 9 or less is capable of rendering this output. TIER 1: Partial hardware and software rendering. You might use Directx9 or greater to use this tier. TIER 2: Full hardware acceleration. Directx9 or above can render this output. To know more about it, refer here [^] . UIElement: Adds supports for WPF features like layout, input, events, etc. Control: The UI elements that interact with the user. They can be Templated to change look. Here the blank window is produced. Height / Width represents the Size of the Window. Title determines the text which is displayed in the TitleBar of the window. Every control in XAML could be named with x:Name attribute. This will be used to reference the Window object in your XAML. x:Class attribute represents the class which should be associated with current Window. As I already told you, that XAML is not self sufficient, so to define logic you need a class in C# or VB.NET. Grid is the primary layout for WPF application. Grid can take multiple Child elements. So let us put some controls into the grid. You can see that I have defined RowDefination and ColumnDefination. This allows you to divide the grid into cells so that you can place your control exactly where you want to. For each RowDefination and ColumnDefination, you can use Height and Width of it. You can see I have used 50, Auto, and * as width. Auto represents the size which we would define for the control during control definition. * indicates the rest of the space which it can take. Thus, you can see the button is spread the rest of the area of the column it finds. Now in the Behind, I put a Messagebox to show the content of TextBox. If you have noticed the XAML minutely, you might wonder how I can define the property of Grid within other controls. Like I defined Grid.Row=0 in each of the control. This is actually possible due to the use of Dependency properties. It's a new feature introduced with WPF. We will discuss in detail later on.